Shopping for G.I. Joe Mini-Figures? G.I. Joe: A Real American Hero comes to 3-D life! This Series 1 4-pack contains 4 individually blind-packaged figures. Series features Blowtorch, Cobra Soldier, Copperhead, Major Bludd, and more! Mix and match their interchangeable weapons. Watch for the rare chase figures! G.I. Joe: A Real American Hero comes to 3-D life in these terrific figures! The G.I. 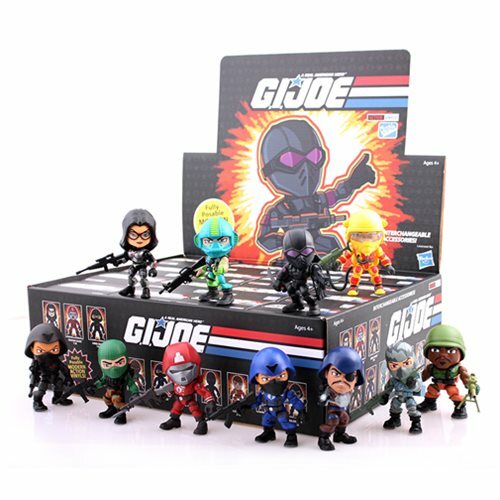 Joe A Real American Hero 3-Inch Random Figure Mini-Figure assortment features some wonderfully stylized vinyl mini-figures with the likenesses of your favorite characters from the G.I. Joe: A Real American Hero series, including Snake Eyes, Blowtorch, Cobra Soldier, Copperhead, Firefly, Dusty, Crimson Guard, Roadblock, Beach Head, and more. Each blind-box packaged figure measures 3-inches tall, with head and arm articulation for fun posing. You can mix and match their awesome array of interchangeable weapons, and there are even rare chase figures to watch for and collect! Ages 4 and up. This G.I. Joe: A Real American Hero 3-Inch Random Figure Series 1 Mini-Figure 4-Pack contains 4 individually blind packaged figures (subject to change).